One extant genus containing 12 species; five extinct genera including seven species in total (Yu et al 2011). Solitary endoparasitoids of chrysopid larvae (Neuroptera) emerging from host cocoon (Masner, 1993). Choi, G.W., KIM, C.J., & LEE, J.W. 2012. 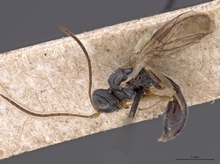 First record of the family Heloridae (Hymenoptera: Proctotrupoidea) from Korea. Entomological Research 42: 122-126. Latreille (Hymenoptera: Heloridae), with description of a new species from Sulawesi (Indonesia). Zoologische mededelingen 80: 1–12.